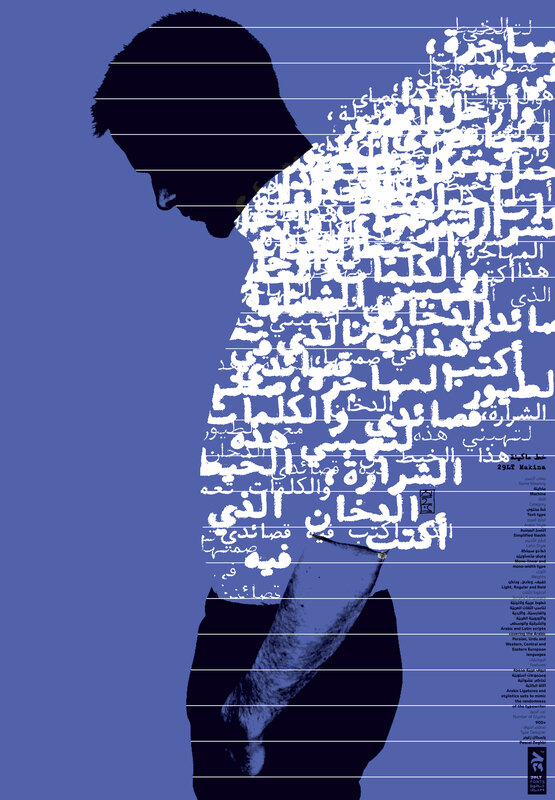 29LT multilingual typefaces were offered to the renowned Iranian graphic designer, Reza Abedini, for him to explore their potential and create compelling typographic posters. Abedini experimented with the typefaces using a striking and playful approach instead of merely typesetting the fonts in clean and corporate typographic layouts. 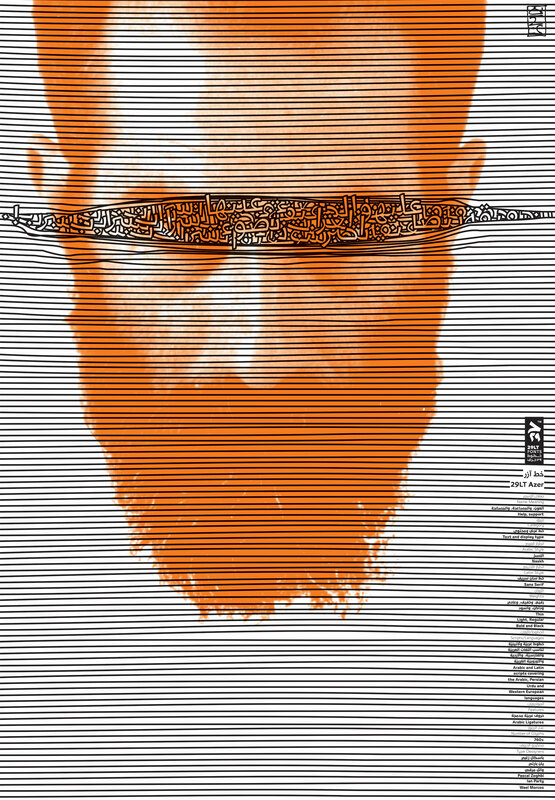 Since we wanted the posters to be a collaborative effort between Abedini’s (graphic designer) and my (type designer) skills, Abedini had full freedom to play with the fonts and create unique visuals, instead of just designing the posters to showcase the fonts. Abedini wanted the posters to stand by themselves as unique visual items and not only as typographic products promoting a certain set of fonts. 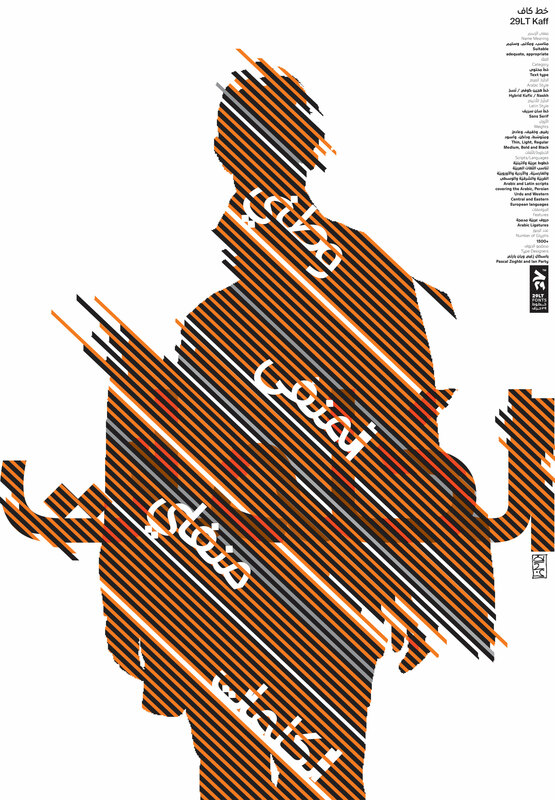 29LT Posters designed by Reza Abedini. Each poster is designed with one of 29LT fonts. 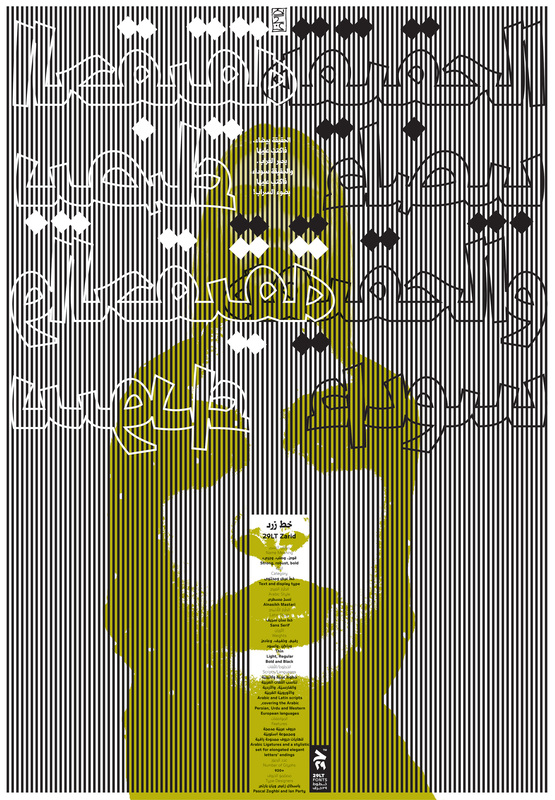 A human figure was introduced in each poster to interact with the typeface displayed. A young Arabic literature expert, Hussein Nasseeddine, gave Abedinin a set of phrases and quotes written by several renowned Arabic poets and writers such as Illias Khoury, Hassan Dawood, Mahmoud Darwish, among others. 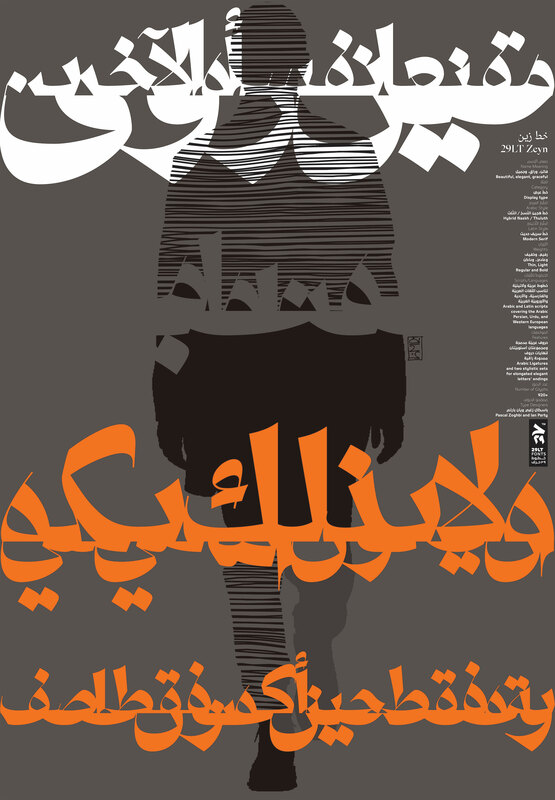 In each poster, the selected text, the human silhouette, and one of 29LT fonts were meticulously chosen to create the right visual aspect of the poster. First step Black on white without any human figure. Second step. Addition of the designated human figure. Third step. 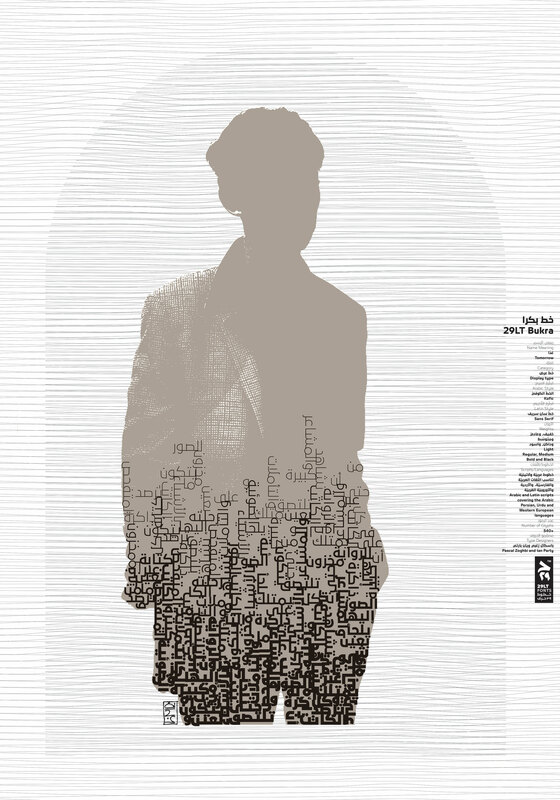 Random overlaying of a second human figure chosen from any other poster. The result was a colorful set of interactive posters integrating type and images. The 29LT Zarid typeface is very robust and echoes seriousness. Its black edgy pen strokes contrast sharply with the white space within and around them. Abedini chose to work with the quote of Mahmoud Darwish, “The Truth is white, so write it in the ink of crow. And the Truth is black, so write about it with the light of the mirage” to reflect the seriousness of the type design and the humanistic idea of Black and White. The font was outlined and overlaid with a pattern of striped lines reflecting the vagueness of black or white truth. The typographic visual was emphasized with a figure of a speechless woman and that of a superior woman with a loud voice coming from inside her. 29LT Zarid Type-Family will be available in early 2015. The 29LT Massira typeface is a freehand type inspired from the political graffiti writings in Beirut. 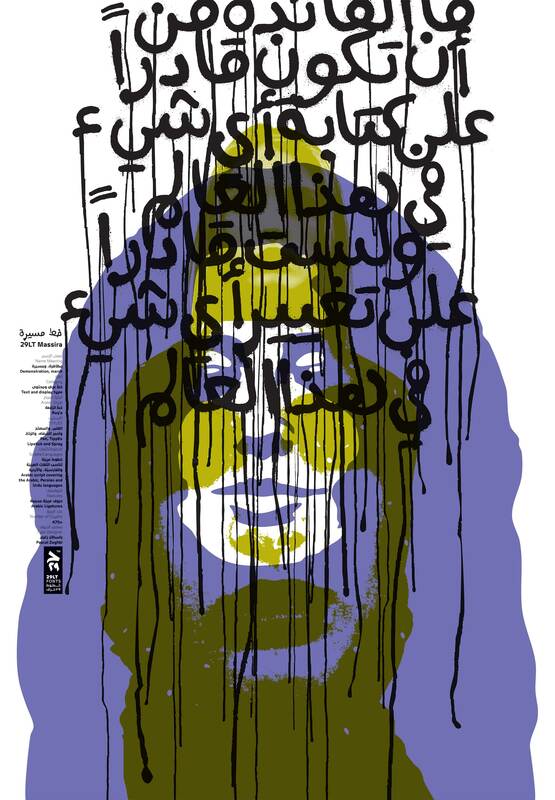 Abedini chose a revolutionary satirical quote from Mohammad Al Maghout “What is the benefit in being able to write anything in this world, when you are unable to change anything in it.” The human figure is taken from a screen shot of a woman from a political movie. She represents the revolutionary ideas of women even when they are shown to be calm in statues. 29LT Kaff Type-Family will be available in early 2015. I became friends with Reza in 2008 and later-on colleagues at AUB (American University of Beirut). Since then, we always thought of what kind of collaboration we can collaborate on, but constantly busy schedules postponed our intentions and willingness. 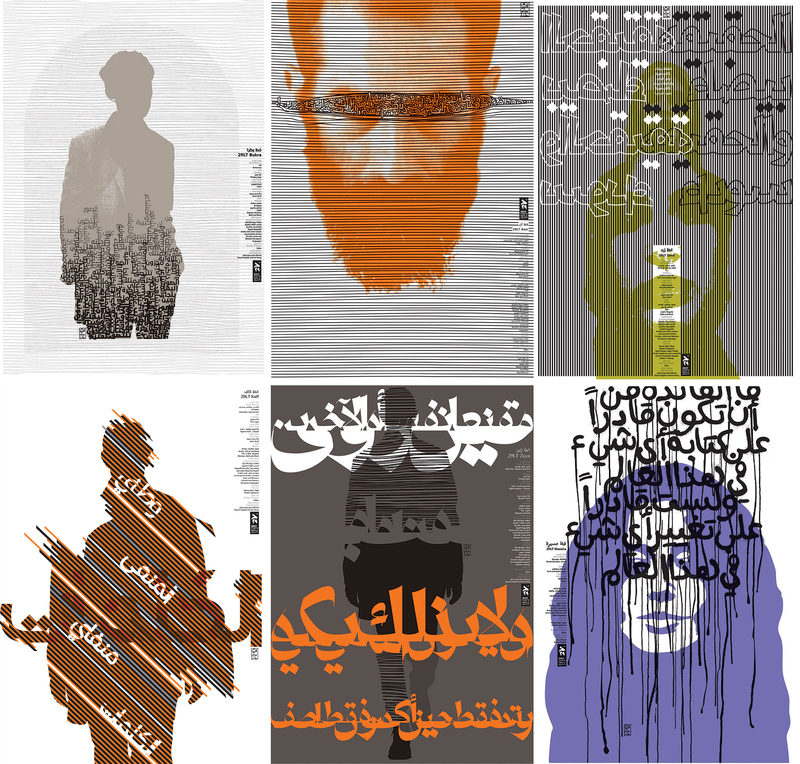 29LT Posters were made available for the first time at Nuqat Design conference 2014 via The Yard bookstore. Amazing! Is it possible to buy any of these posters? I’ve been searching through your website as well as the rest of the internet, but with no luck. I’d like so bad to buy one! Thanks a lot for providing individuals with a very brilliant possiblity to read critical reviews from this blog. always motivated for the outstanding advice you serve. Certain 2 areas on this page are in truth the finest I’ve ever had.